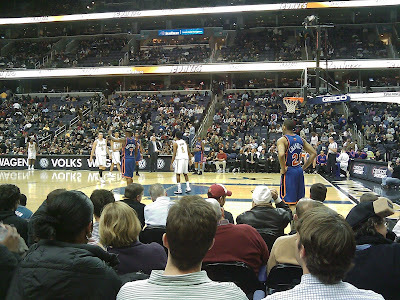 I went to the Washington Wizards / New York Knicks game last night with Doe, my brother and my sister-in-law. The photo above is a view from the swanky upgraded seats we had for the game. Nate's season ticket contact gave him the free upgrade for birthday gift. He usually sits in section 107 in the corner of Verizon Center. These seats were Row B and we had a great up-close look at just how tall these NBA players are. It was also easy to heckle the Knicks from this close. I didn't get to stay in the seats the entire game as Doe and I swapped out with my friend Josh and his girlfriend at halftime. After blowing a halftime lead, the Wizards came back on a 15-0 run during the last few minutes of the final quarter and sent us all happily on our way to Nate's birthday party at RFD. Big thanks to Doe and Nate for the ticket hookup and suprisingly my record at Wizard games this season is a winning one (2-1). Unfortunately during this disaster of a season, the team only has 8 wins altogther which puts them in a tie for the lowest win total in the NBA.